Thomas Carmichael is currently Dean of the Faculty of Information and Media Studies at Western. He is also an Associate Professor in the Department of English, and a Core Faculty Member in Western’s Centre for the Study of Theory and Criticism. He has published widely in American Studies and on American Literature, and on literary, cultural, and critical theory. He has lived in London for more than twenty years. Robin Armistead has worked for the City of London for 25 years in various departments. She has worked with the Creative City Task Force and participated with the development of their report, which was approved by Council in 2005. She is currently the Manager of Culture and oversees the running of the Culture Office for the City. She has an educational background of a bachelor of Urban and Regional Planning from the University of Waterloo and a Masters of Social Planning from Wilfred Laurier University. She is currently a member of the Board of Directors for the Creative City Network of Canada. Robin enjoys being a creative person with a variety of interests in the fields of heritage, art, environment and working with a variety of people such as people with disabilities, students and newcomers. Patrick Mahon is an artist, writer and teacher/academic; he was Chair of Visual Arts at Western University, between 2000 – 2010. He is a Board member at Museum London and tye London Arts Council. Mahon’s artwork has been exhibited widely, both nationally and internationally, including, in Canada at Museum London, The Hamilton Art Gallery, the Southern Alberta Art Gallery and Kamloops Art Gallery, and internationally at the Sichuan Fine Arts Institute in Chongqing, China, in 2005, and in Barthète (Toulouse), France in 2011. Patrick Mahon co-curated the exhibition, “Barroco Nova: Neo-Baroque Moves in Contemporary Art”, with Susan Edelstein in Fall, 2011. The SSHRC-funded collaborative artist’s project, Art and Cold Cash, which involved Mahon and other artists from southern Canada and from Baker Lake, Nunavut, was produced between 2004 and 2008; a book published by YYZ was released in 2010. Patrick’s new collaborative SSHRC project, Immersion Emergencies and Possible Worlds, on the theme of water, began in 2010 and will include a residency at the Banff Centre in 2013. He lives in London, Ontario. Joshua Lambier is currently a PhD candidate in the Department of English at Western, specializing on the convergence between British and European Romantic literatures and theories of human rights. Lambier is also the Program Director for a new program, The Public Humanities @ Western, designed to enhance the Faculty of Arts and Humanities’ commitment to the promotion of innovative forms of publicly engaged knowledge creation, experiential learning, and campus-community collaboration. His research has been supported by the Pierre Elliott Trudeau Foundation and the Social Sciences and Humanities Research Council of Canada. 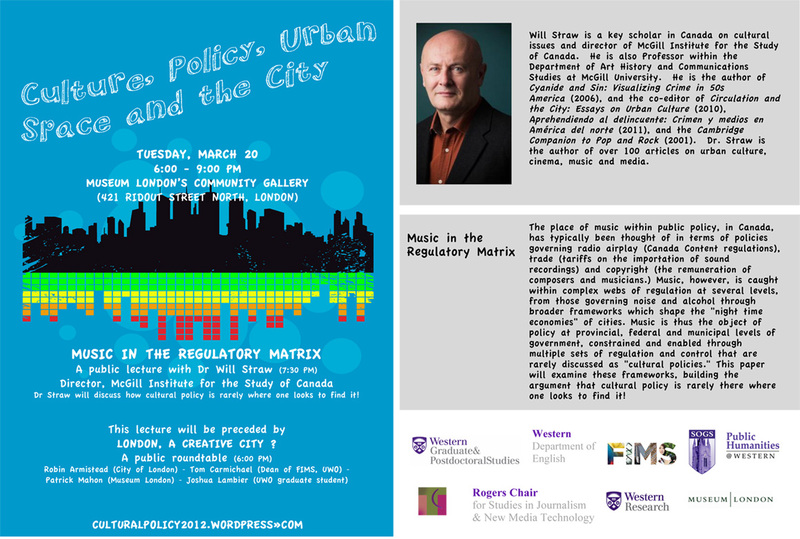 The place of music within public policy, in Canada, has typically been thought of in terms of policies governing radio airplay (Canada Content regulations), trade (tariffs on the importation of sound recordings) and copyright (the remuneration of composers and musicians.) Music, however, is caught within complex webs of regulation at several levels, from those governing noise and alcohol in cities through broader frameworks which shape the “night time economies” of cities. Music is thus the object of policy at provincial, federal and municipal levels of government, constrained and enabled through multiple sets of regulation and control that are rarely discussed as “cultural policies.” My paper will examine these frameworks, building the argument that cultural policy is rarely there where one looks to find it. Here are the readings for the seminar, to be held on Wednesday, March 21 at 9:30 AM (University College 224A). Gaonkar, D. P. & Povinelli, E. A. (2003). “Technologies of Public Forms: Circulation, Transfiguration, Recognition”, Public Culture, 15(3), p. 385–397. Straw, W. (2010). “The Circulatory Turn,” in B. Crow, M. Longford & K. Sawchuck (eds), The Wireless Spectrum: The Politics, Practices and Poetics of Mobile Media (p. 17-28). Toronto: University of Toronto Press. With generous support from FIMS, the Rogers Chair for Studies in Journalism and New Media Technology, and the Centre for the Study of Theory and Criticism, and the Department of English.